On Feb. 7, 1919, the Mighty Signal’s first paper published. “It was the end of World War I and life, and invention, were erupting with a jubilant fierceness,” writes Time Ranger John Boston. Join Valley Industry Association (VIA) as it celebrates The Signal newspaper. 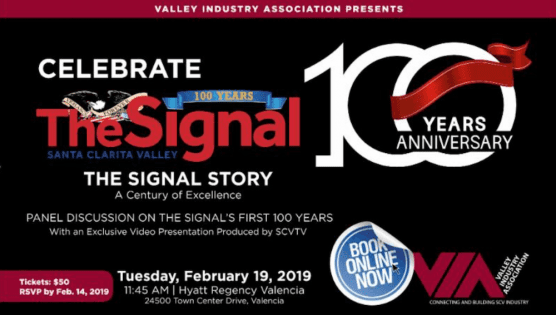 “The Signal Story – A Century of Excellence,” at the VIA Monthly Luncheon on Tuesday, Feb.19, at 11:45 a.m., at the Hyatt Regency Valencia. Reservations required. Tickets available at www.via.org/calendar. Table sponsorships for this special event are available. Contact Kathy Norris at (661) 294 – 8088 for details.